This is alpha software. Please do not use it in production. The Elgg team is excited to announce the immediate availability of Elgg 2.0.0-alpha.1 for download. This pre-release of Elgg 2 is meant for early testers and plugin developers who want to get a head start upgrading plugins to make sure they are ready when 2.0.0 final is released. Plugins authors can read through the plugin upgrade instructions for details on what they will need to change. For the most part, breaking changes should not affect those who have already updated their 1.x-compatible plugins to the latest APIs and coding standards. Discussions is now a separate plugin from groups. 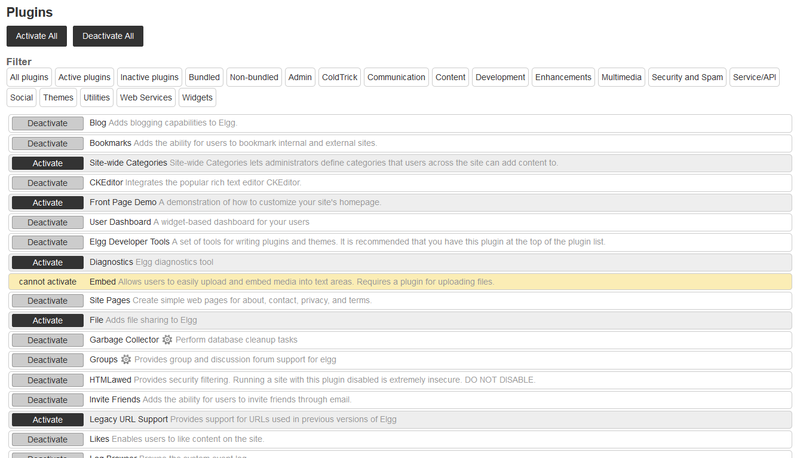 The plugin manager page in the admin area has been much improved. Initial render time over 2G has been reduced by ~85% for almost all pages. Simplecache resources can be served directly by the web server. We dropped login-over-https. For the security and privacy of your users, serve your whole site over HTTPS instead. Besides JS and CSS, you can now serve images, HTML, and many other asset types through Simplecache by placing your custom assets in the views system. Elgg 2 can be installed as a composer dependency, which makes upgrading and duplicating sites significantly easier. When installed as a composer dependency, you may use the root directory to make site-local modifications. There is no more need to define a plugin just to customize a single site. Overriding the home page (and many other pages) is much easier now that we use the views system to render pages. You can easily define custom locations for individual views using a views.php config file. Watch the blog for further announcements and updates about 2.0. We look forward to your feedback and questions! Cheers guys , you guys have done a great work ..
"Simplecache resources can be served directly by the web server." I don't think video file extensions are in the whitelist, and even if they were, it probably wouldn't be a good idea. Yea, simplecache is not intended for video files or any user generated content really. But it does set a precedent that it is possible to make such a thing happen I suppose! Hello, i have Elgg 1.12, how can I install the Alpha Release on top of it? @Rinaldo -- don't do that. 2.0 is not ready for production use. We'll give more updates/instructions when we start issuing release candidates. No. Please don't, as the past clearly states in bold.